Randomly distributing the original route segments, such that all alternative routes start at the same point and end at the same point and all have the same set of route segments. Making lists of the distances, bearings and internal angles traveled by each segment of the original route, then randomly drawing from those lists. Randomly relocating the entire route, with options to randomize either the origin point, the orientation or both. You can compare characteristics of your random routes with characteristics of the actual route the animal used. This extension will derive several indices on each alternate route based on the geometry of that route, and more indices based on attributes of a polygon theme that the routes cross through (Land Cover types, for example). 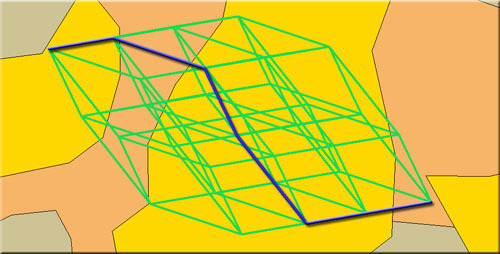 For users with Spatial Analyst and 3D Analyst, the author recommends his "Surface Tools" extension to derive topographic characteristics of the alternate routes (see http://www.jennessent.com/arcview/surface_tools.htm). Combine route segments into complete routes. Analyze habitat characteristics of routes by intersecting them with a habitat polygon theme and calculating the distances and proportions of each route that traverse each unique habitat type. Analyze habitat characteristics of the buffered areas around the routes, again by intersecting them with habitat polygons and calculating the areas and proportions of each route buffer that overlays each unique habitat type. Add a field containing record numbers to a table. OUTPUT: This extension will generate polyline themes of alternate routes based on tables, point themes and polyline route themes. The alternate route themes include several indices describing geometric aspects of the route and how much they deviate from the original route. The tools that analyze habitat characteristics will identify all unique polygon attributes in intersecting polygons, and then generate the length and the proportion of the route that lays within each habitat type. In these cases you also have the option to save your clipped polylines or polygons in a separate shapefile. REVISIONS: Version 2 adds methods to generate random routes based on segment lengths and bearings independently, and to randomly relocate and rotate the entire route. Version 2 also includes several stand-alone tools to intersect routes with polygons, combine route segments and to add record number fields to datasets. Version 2.1 (April 12, 2005) adds the option to randomize routes by randomly selecting from the original set of internal angles in the original route. This version also fixes bugs relating to sorting by date, attempting to randomize segments in a polyline with ≤ 1 segment, and intersecting polylines or polygons with background polygon themes or randomizing routes while not copying any of the original fields to the new theme. Jenness, J. 2004. Alternate animal movement routes (altroutes.avx) extension for ArcView 3.x, v. 2.1. Jenness Enterprises. Available at: http://www.jennessent.com/arcview/alternate_routes.htm.